James CARVER (1527 – c. 1568) was Alex’s 13th Great Grandfather; one of 32,768 in this generation of the Miner line. There is no documentary proof that James Carver and Catherine [__?__] were the parents of Isaac and John Carver, the first governor of the Plymouth Colony, but there is strong circumstantial evidence. James Carver was a yeoman of Doncaster, Yorkshire. The parish where John Carver was baptized was only seven miles from Austerfield which is next to Bentley where the early English homes of the Brewster and Bradford families were located. It is possible that the father’s name was Robert, not James. Charles Edward Banks in English Ancestry and Homes of the Pilgrim Fathers identified John Carver as the son of Robert Carver and gives his baptism at Duncaster, County York , on 9 Sep 1565. The NEHGR, Vol. 67, p. 382 (October 1913) has two baptismal records which bear out this statement: “1564 Sept. 9 John, s. of Robert Caruer” and “1567 March 27 Wilim s. of Robte Caruer.” These entries were copied from the parish register of Duncaster, County York and were found in a manuscript volume in the Library of the New England Historic Genealogical Society. – Isaac Carver of Boston, Lincolnshire, the father of Robert from whom most American Carvers descend. Died at Leyden, Holland. – Wilim Car(v)uer Bpt. 27 March 1567, Doncaster Parish Register. John Carver was a Pilgrim leader. He was the first governor of Plymouth Colony and his is the first signature on the Mayflower Compact. He and hs wife Catherine were members of the Leiden Separatist community and first definitively appear in the records of LeIden in 1615. Apart from the name of Catherine, his wife’s identity is not certain. They had no surviving children, although they may have buried two infants in Leiden, one in 1609 and one in 1617. Carver was a wealthy London merchant. The first definitive record of the Carver’s involvement in the Leiden Separatist community appears in 1616, where he served as deacon of the church. He was very much welcome in the group because of his willingness to bear the financial expenses. He donated much of his personal estate to the Pilgrim congregation and to the Mayflower voyage. In 1617, he became the agent for the Pilgrims in securing a charter and financial support for the establishment of a colony in America. Carver chartered the Mayflower and was chosen as governor of the ship. With 101 other colonists, he set sail from Plymouth, England, in September 1620. He traveled with his wife, Catherine, and with one servant Desire Minter, and Jasper More, a child of seven years of age. Bradford says “Desire Minter returned to her friend and proved not very well and died in England.” No known husband or children. Jasper’s three brothers and sisters were given into the care of other senior members of the company. Until relatively recently the children were thought to be orphans or foundlings, but, in the 1990’s, it was conclusively shown that they were sent to America because they were illegitimate, and the source of great controversy in England. It is not known whether Carver knew anything about Jasper’s’s background. Jasper died on the Mayflower, at Cape Cod Harbor, 16 Dec 1620. 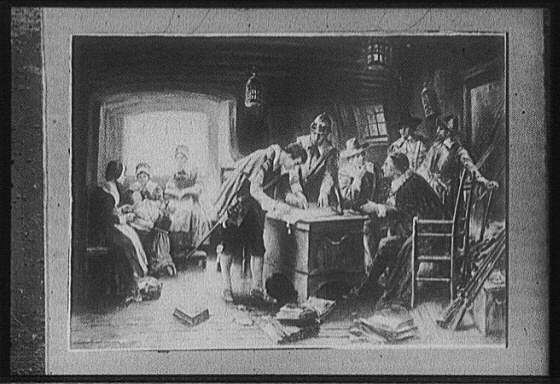 Carver signed the Mayflower Compact on November 11, 1620, and on the same day was elected governor of the colony. He was regarded as “a gentleman of singular piety.” In March 1621, Carver established a peace treaty with Chief Massasoit of theWampanoag tribe. This was one of America’s most successful Indian treaties, lasting for over half a century. Carver died suddenly one month later after falling ill while working in the fields, probably of a stroke. William Bradford was named his successor. 22 May 1615 – Roger Chandler, sayworker, bachelor from Colchester in England, accompanied by Roger Wilson his acquaintance with Isabel Chilton, spinster, from Canterbury in England, accompanied by Sarah Minther and [Cathelyna Kerver] Catherine Carver, her acquaintance. 12 May 1616 – Henry Wilson, pumpmaker, bachelor, (from) Yarmouth in England, accompanied by William Jepson and John Carver [Jan Kerver}, his acquaintances with Elisabeth Nicholas, spinster, also from Yarmouth in England, accompanied by Sarah Minther and Dorothy Bradford, her acquaintances. 3 Mar 1617 – John Michaelson (Jennings), merchant, from Essex in England, widower of Elisabeth Pettinger, accompanied by John Carver [Jan Kerver] his acquaintance, dwells at the clothier’s near Douver in Marendorp, with Rose Lile, spinster, from Yarmouth in England, accompanied by Rose Jepson, her acquaintance. 19 May 1617 – Robert Cushman, woolcomber, from Canterbury in England, widower of Sarah Cushman, dwelling in an alley in the Nonnensteech, accompanied by John Keble, his acquaintance, with Mary Singleton, from Sandwich in England, widow of Thomas Singleton, accompanied by Catherine Carver [Cathelyne Kerver], her acquaintance. 12 Nov 1617 London – “A Coppy of a letter from Sir Edwin Sands directed to mr John Robinson and mr William BREWSTER. My dear brother, I received enclosed in your last letter the note of information, which I shall carefully keep and make use of as there shall be occasion. I have a true feeling of your perplexity of mind and toil of body, but I hope that you who have always been able to plentifully to administer comfort unto others in their trials, are so well furnished for yourself, as that far greater difficulties than you have yet undergone (though I conceive them to have been great enough) cannot oppress you; though they press you, as the Apostle speaks. the spirit of a man (sustained by the Spirit of God) will sustain his infirmity; I doubt not so will yours. And the better much when you shall enjoy the presence and help of so many godly and wise brethren, for the bearing of part of your burthen, who also will not admit into their hearts the least thought of suspicion of any the least negligence, at least presumption, to have been in you, whatsoever they think in others. “Now what shall I say or write unto you and your good wife my loving sister? Even only this: I desire, and always shall, unto you from the Lord, as unto my own soul. And assure yourself that my heart is with you, and I will not forslow my bodily coming at the first opportunity. I have written a large letter to the whole, and am sorry I shall not rather speak than write to them; and the more, considering the want of a preacher, which I shall also make some spur to my hastening after you. I do ever commend my best affection unto you, which if I thought you made any doubt of, I would express in more and the same more ample and full words. “Your large letter, written to Mr. Carver and dated the 6th of July 1621, I have received the 10th of November, wherein after the apology made for yourself you lay many heavy imputations upon him and us all. Touching him, he is departed this life and now is at rest in the Lord from all those troubles and encumbrances with which we are yet to strive. He needs not my apology; for his care and pains was so great for the common good, both ours and yours, as that therewith (it is thought) he oppressed himself and shortened his days; of whose loss we cannot sufficiently complain. It is highly unlikely that this chair actually belonged to John Carver, the first Governor of Plymouth Colony. Although the chair was long thought to have been brought on the Mayflower by Carver, a recent wood analysis determined that the chair was actually made in America. American white ash does not grow in England. Governor Carver died in Spring of 1621 and it is not probable that people in the fledgling colony had time to build such a chair during that first devastating winter when half the Pilgrims died. 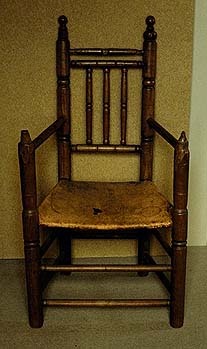 The name of Plymouth’s first governor, however, has been firmly attached to this type of Early American chair; chairs with turned spindles in the back only are known generically today as “Carver chairs.” They differ from Brewster Chairs, which have spindles under the seat and arms as well. The chair is related to other chairs made by craftsman Ephraim Tinkham (1649-1713), who worked in Plymouth and Middleboro. Carver Sword — Material : Steel, iron, silver and wood Ownership attributed to John Carver. The “Carver sword,” on loan to the Pilgrim Society from the Massachusetts Historical Society, was donated to the Massachusetts Historical Society by Ichabod Shaw of Plymouth in 1795. The decoration and workmanship are typical of English swords of the early 17th century. The town of Carver, Massachusetts, just west of Plymouth, was named for him. “History of the Plymouth Church, 1620-1680, by William Bradford and Nathaniel Morton,” Plymouth Church Records [Publications of the Colonial Society of Massachusetts, Volumes XXII and XXIII. Boston : The Society, 1920 and 1923]. Volume 1, p. 31-33. This entry was posted in Artistic Representation, First Comer, Line - Miner, Place Names, Wikipedia Famous. Bookmark the permalink. You have James Carver (1527 – 1560) dying in 1560, yet he has three sons born to him between 1562 and 1567. Please explain. There probably is no existing record of James Carver’s death.